This has been one of the best Mother’s Day weeks I have ever had. Not because I’ve been pampered or showered with gifts, chocolates or flowers or because I’ve been spoiled with no limits. The reason I have been so happy is because my daughter has been the happiest during the last couple of days. We were blessed this year with the opportunity to share with others our story through different media outlets. Let people have a glance of how is a day in a family with a kid born with a genetic neurological condition. My daughter, aware of all the attention has been having a blast. Every picture, every video and every interview she has been on point, smiling at the cameras and with everybody around. She was quite aware that everything was about her. And she doesn’t have that kind of experience often. So she has been having a blast. I can’t express with words how happy that has made me. That’s a feeling that only can come from a mother’s love. So even in the hardest and toughest days, when we can feel as total failures in the motherhood department, when we remember how happy we are with the happiness of our kids we realize that it’s not that bad. To celebrate the special mom’s love I wanted to make a cake with floral, sweet and pink flavors. I created this coconut Bundt cake with a tangy hibiscus glaze. I basically adapted my own recipe for the Mexican Hot Chocolate Bundt Cake that I shared with you a few weeks ago. It’s so simple and yet so delicious that I wanted to recreate it with these floral flavors for this lovely occasion. 1. I used a large amount of coconut extract compared to other recipes because coconut is not a flavor that stays easily after baking. I used more coconut extract in the simple syrup to enhance it even more. 2. Also, I used coconut oil instead of butter and coconut milk instead of regular milk. 3. Even if I’m not a fan of changing the oven temperature while baking, this cake really benefits from being baked at a nice low 325° temperature and increasing to 350° the last 10 to 5 minutes to make sure the center is completely cooked. To make the cake: Place oven rack in the third tier of the oven. Preheat oven to 325°. Spray very throughly the cake pan with cooking or baking spray. Place the coconut oil and sugar in the bowl of a stand up mixer and mix with the whisk attachment for 5 minutes in medium speed (level 4). In the meantime combine well the flour and the baking soda in a medium bowl using a whisk. With the mixer running, add the eggs, one at a time, waiting until one is just combined to add the next. Whisk about 30 seconds more. Add in the coconut extract, vanilla and salt and mix a couple of seconds to integrate. Retire from oven and let it cool down for a few minutes. Using a large toothpick stick poke semi deep holes through the bottom of the cake. Brush about half of the syrup (recipe below) through it. Wait 10 to 15 minutes. Turn the cake into a large plate and carefully poke more holes through the top. Brush the remaining syrup through the top and the sides of the cake. Let it rest 10 minutes more. 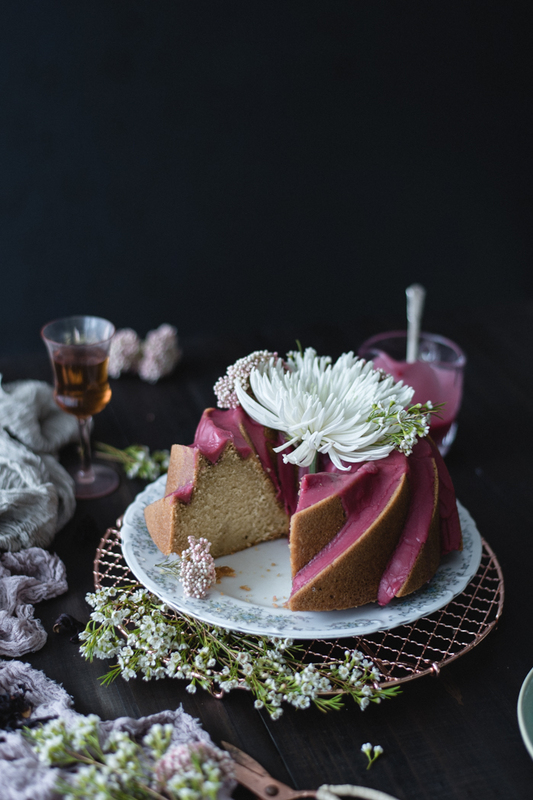 While the cake is resting, place the dried hibiscus flowers and water in a small saucepan. Boil for 20 to 25 minutes, until the water has reduced approximately ¼ of a cup. Retire the saucepan from the heat and strain the liquid into a medium bowl. Start adding the sugar to the liquid in small amounts and mix with a whisk until you have used it all and the glaze has no lumps. Add a bit more of water or coconut milk to make the glace runnier or a bit more of sugar to make it thicker. Pour over the top of the cake. To make the simple syrup: Mix all the ingredients in a small saucepan and bring to a boil. Lower down the heat to simmer and cook for 2 minutes. Give it a stir and cook for an extra 2 minutes. Remove from heat and let it cool down a bit before brushing the cake.